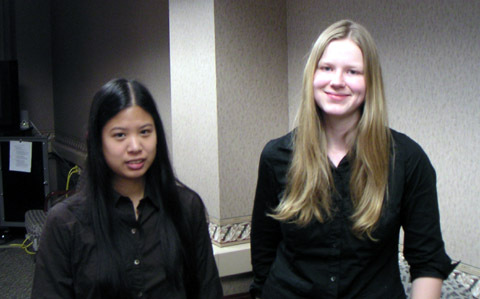 Computer Science undergraduates Nina Tang and Erika Shehan received Honorable Mentions in the 2004 Outstanding Undergraduate Award Program of the Computing Research Association (CRA). The CRA Outstanding Undergraduate Award program recognizes students who show outstanding research potential in an area of computing research. Both Nina and Erika have worked for CERIAS under the supervision of Prof. Spafford and Dr. Meunier. Erika Shehan is a senior who has done impressive work in the areas of computer security and privacy. Among her research projects are the Honeypot Design Research Project (CS 497 Honors Research Project, the INFORMS Project (Project sponsored by Purdue CERIAS), the CERIAS Incident Response Database (CIRDB), and the Privacy Research Project (CS 390 Independent Study). Nina Tang is also a senior with impressive scholarship and research involvement. Her research work for CERIAS includes the CERIAS Incident Response Database (CIRDB) and the Enterprise-Level Information System Assurance (ELISA) system. Nina has just concluded her CS 497 research honors work, contributing to the Honeypot Design Research Project. Congratulations to Erika and Nina on this outstanding award!